Llista de les illes d'Escòcia: Escòcia té nombroses illes i l'illa major forma part de la part septentrional de l'illa de Gran Bretanya. L'oficina del General Register Office for Scotland defineix una illa com "una massa de terra envoltada per l'aigua, separada de la part principal d'Escòcia (from the Scottish mainland)", i aquesta definició no inclou illes enllaçades per ponts, i altres enginys humans. Escòcia té unes 790 illes fora de la costa (offshore islands), la majoria de les quals es poden situar en quatre grups: Shetland, Orkney, i les Hèbrides, subdividides en les Inner Hebrides i les Outer Hebrides. També hi ha grups d'illes en el Firth de Clyde, Firth de Forth, i Solway Firth, i nombroses illetes en masses d'aigües dolces d'Escòcia incloent Loch Lomond i Loch Maree. L'illa més gran és Lewis and Harris que fa 2.179 km², i hi ha unes 200 illes més extenses de 40 hectàrees. D'entre elles són ben conegudes, malgrat ser petites, Staffa i les Flannan Isles. Unes 94 illes escoceses estan permenentment habitades, de les quals 89 són illes fora de la costa i entre els anys 2001 i 2011 la població total de les illes escoceses ha crescut un 4% fins a arribar a 103.702 habitants. Els grups d'illes són: Firth of Clyde, Islay, Firth of Lorn, Mull, Small Isles, Skye, Lewis and Harris, Uists i Barra, St Kilda, Orkney, Shetland i Firth of Forth. "F" designa una illa d'aigua dolça. Les illes d'escòcia inclouen 15 Munros (muntanyes de més de 3000 peus o 914.4 metres), 12 dels munros es troben a Skye, i un total de 227 Marilyns (turons de prominència relativament alta) d'almenys 150 metres sense considerar la seva alçada absoluta. Far de Dhu Heartach (1822-1878). Costa oriental de Mousa cap a Peerie Bard. 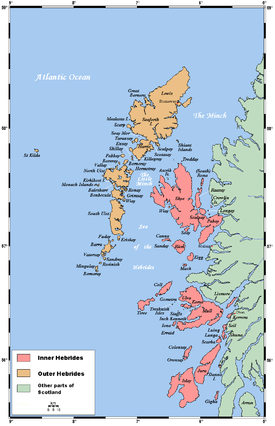 Quatre illes registrades com habitades no consten al cens de 2011: Eilean dà Mhèinn, Eilean Tioram, Holm of Grimbister i Inner Holm. A contiunuació es llisten les illes que segons National Records of Scotland estan "incloses en el NRS statistical geography for inhabited islands però no tenen residents habituals en el moment del cens de 2001 o de 2011." Cap d'elles excepte Holm és major de 40 ha. Les illes d'aigua dolça més notables inclouen Lochindorb Castle Island, Loch Leven Castle Island, St Serf's Inch, i Inchmahome, cadascuna de les quals han jugat un paper important en la història d'Escòcia. Inchmurrin és l'illa d'aigua dolça més gran de les Illes Britàniques. Es troba a Loch Lomond, que conté unes altres 60 illes. 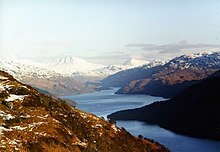 Loch Maree també conté diverses illes, les més gran de les quals són Eilean Sùbhainn, Garbh Eilean i Eilean Ruairidh Mòr. A continuació es presenta una llista d'illes no habitades més petites de 4 hectàrees. Ruins a Eilean Chaluim Chille, prop de Kilmuir, Skye. Llista d'antigues illes que ara ja no ho són per haver quedat enllaçades per terra, per construcció de ports etc. Broch of Clickimin a Loch of Clickimin, Lerwick, a les Shetland. A partir de l'any 200 aquesta illa va quedar permanentment connectada per terra seca. Bunglan actualment està connectada amb Samphrey per dos tómbols. Eilean-a-beithich era una de les Slate Islands . Inch of Culter, antiga illa al Riu Dee prop de Maryculter. Innis Bheag o Paterson Island prop de Portmahomack a Easter Ross, actualment unida a Morrich More. Keith Inch (no s'ha de confondre amb Inchkeith). North Inch, una de les "Inches" a Perth. Rosyth Castle a Firth of Forth. Preston Island, una construcció artificial a Low Valleyfield. Viking Bergen Island, una illa enfonsada en l'Holocè. Whiteinch, actualment una zona de Glasgow. Vatersay, unida a Barra, però no a altres illes. Al nord, Scalpay i Great Bernera estan connectades amb Lewis and Harris. Isle of Skye està connectada a l'illa principal pel pont Skye Bridge que ara incorpora Eilean Bàn. Seil via Telford's 1792 "Pont sobre l'Atlàntic". Hunda està connectada a Burray via una carretera elevada. Broch of Clickimin és un illot en aigües dolces unit a la terra ferma. També hi ha un pont des de Housay a Bruray. Inchgarvie (part de Forth Bridge), unida a Fife i Lothian a la Mainland. Garbh Eilean unida a la terra ferma per Kylesku Bridge. Oronsay siginifica "illa ebb" . El terme "Inch" (Innis) pot significar illa (per exemple, Inchkenneth, Inchcolm), però també es fa servir per terra ferma envoltada per un aiguamoll, per exemple, Markinch, Insch. Eilean és la paraula en gaèlic escocès per a "illa". Tanmateix, Inistrynich, Eilean na Maodail, Eilean Dubh i Liever Island són tots ells promontoris a Loch Awe. Igualment Eilean Aoidhe a Loch Fyne. La Black Isle és també An t-Eilean Dubh en gaèlic, mentre que Eilean Glas forma part de Scalpay. "-holm" és un sufix comú en diversos llocs de l'interior, per exemple, Langholm, Kirk Yetholm, Holmhead (per Cumnock), Holmhill (proper a Thornhill, Nithsdale). Per exemple, Vementry; Oldany Island; Cramond Island; i Eilean Mhealasta a les Outer Hebrides, que rep el nom de Mealista a Lewis. Bailey, Patrick «Faroe, Orkney, Gran Canaria: Case Studies in the Geography of Marginal Europe». Geography, 83, 4, 1998, pàg. 309–21. JSTOR: 40573105. Coull, J. R. «A Comparison of Demographic Trends in the Faroe and Shetland Islands». Transactions of the Institute of British Geographers, 41, 1967, pàg. 159–66. JSTOR: 621333. General Register Office for Scotland (28 novembre 2003) Scotland's Census 2001 – Occasional Paper No 10: Statistics for Inhabited Islands. Retrieved 26 February 2012. MacDonald, Fraser (2006) "The last outpost of Empire: Rockall and the Cold War". Journal of Historical Geography/Sciencedirect.com. 32. Retrieved 1 May 2012. Nicolson, James R. (1972) Shetland. Newton Abbot. David & Charles. Symonds, James (June 1999) "Toiling in the Vale of Tears: Everyday Life and Resistance in South Uist, Outer Hebrides, 1760—1860". International Journal of Historical Archaeology/JSTOR. 3 No. 2, Archaeologies of Resistance in Britain and Ireland, Part II, pp. 101–122. Retrieved 8 September 2013. Turnock, David «Regional Development in the Crofting Counties». Transactions of the Institute of British Geographers, 48, 1969, pàg. 189–204. JSTOR: 621498. ↑ Les superfícies, indicades amb un asterisc. provenen de mapes d'Ordnance Survey i General Register Office for Scotland statistics. ↑ Aquesta illa té un hotel però en el cens no consta com una illa. ↑ Aquesta illa està a (Plantilla:Gbmapping and the evidence of both Ordnance Survey maps and photographs (e.g. "Houses on Seana Bhaile" Geograph. Retrieved 10 August 2009) indicates a resident population. There is even a name, "Seana Bhaile" for the main settlement. However, neither the census nor the main reference work (Haswell-Smith 2004) refer to the island at all. Its small population is presumably included in nearby Grimsay (which has a population of over 800) by the census. ↑ Referida pel National Records of Scotland (2013) com "Inchruin",. ↑ "Scotland's 2011 census: Island living on the rise". BBC News. Retrieved 18 August 2013. ↑ General Register Office for Scotland (28 November 2003) Scotland's Census 2001 – Occasional Paper No 10: Statistics for Inhabited Islands. Retrieved 26 February 2012. ↑ D.A. Bearhop. Munro's Tables. Scottish Mountaineering Club & Trust, 1997. ISBN 0-907521-53-3. ↑ Haswell-Smith (2004), save as otherwise stated. ↑ 16,0 16,1 16,2 National Records of Scotland (15 August 2013) (pdf) Statistical Bulletin: 2011 Census: First Results on Population and Household Estimates for Scotland - Release 1C (Part Two). "Appendix 2: Population and households on Scotland’s inhabited islands". Retrieved 17 August 2013. ↑ Plantilla:Ordnance Survey Note that the maps mark the height above sea level of a high point on most islands, but in a small number of cases, this may not be the highest peak. ↑ 20,00 20,01 20,02 20,03 20,04 20,05 20,06 20,07 20,08 20,09 20,10 20,11 Rick Livingstone’s Tables of the Islands of Scotland (pdf) Argyll Yacht Charters. Retrieved 12 Dec 2011. ↑ "Come to our Island and Enjoy...". Isle of Eriska Hotel. Retrieved 9 September 2013. ↑ 22,0 22,1 The census does not list South Walls as an island, but includes the total in Hoy. ↑ «Loch Lomond Islands - Inchmurrin». Loch Lomond.net. [Consulta: 20 abril 2012]. ↑ 24,0 24,1 Dow, Jim (2005) Islands Galore. A Scottish Islands Handbook. Edinburgh. Black & White Publishing. ↑ "Broch of Clickimin" Undiscovered Scotland. Retrieved 20 December 2009. ↑ "Slate Islands - The Islands that Roofed the World" southernhebrides.com. Retrieved 14 November 2009. ↑ "Local Names" Culter.net. Retrieved 3 January 2009. ↑ Hansom, JD and Black, SDL (1996) "The Geomorphology of Morrich More: Management Prescription Review" (pdf) SNH. Retrieved 29 November 2009. ↑ «Preston Island». Gazetteer for Scotland. [Consulta: 26 desembre 2009]. ↑ Clickimin Broch Gazetteer for Scotland. Retrieved 25 April 2010. ↑ Pàrlamaid na h-Alba placenames Retrieved 16 July 2007. ↑ "What is a crannog?" Scottish Crannog Centre. Retrieved 26 December 2008. La pàgina va ser modificada per darrera vegada el 17 ago 2018 a les 04:19.